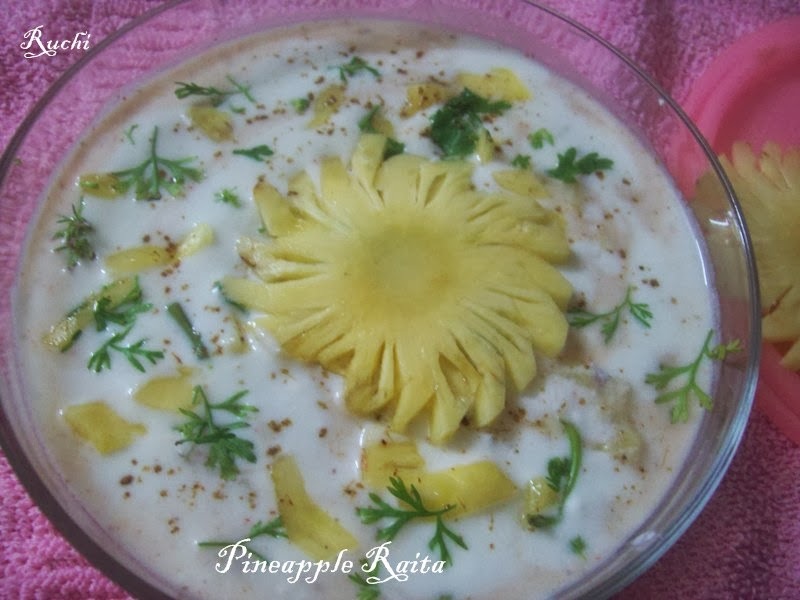 Delicious Pineapple Raita in meal provides a very cool and refreshing feeling. This amazing raita goes well with any spicy meal. 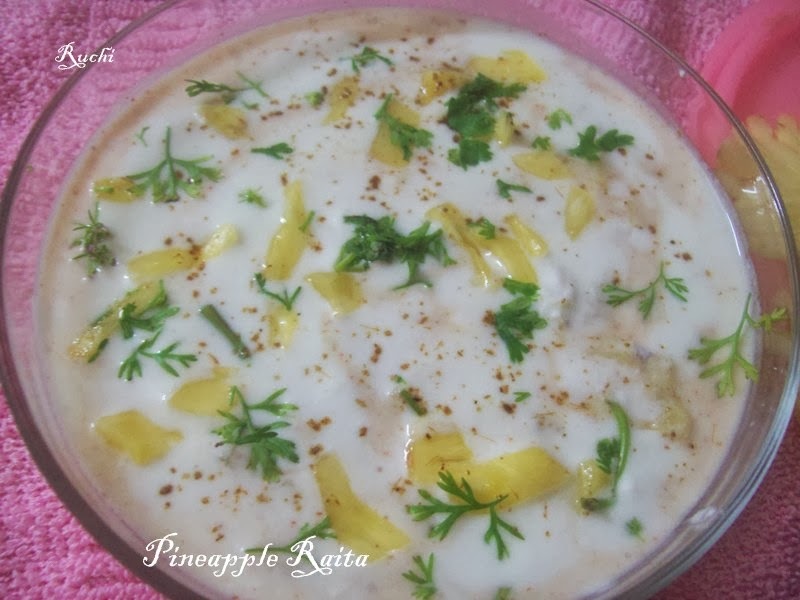 It is a perfect blend of pineapple chunks and creamy yogurt and its sweet and salty - a very distinguishing flavor, is a great twist to the regular raita. Pineapple raita, is my all time favorite and it has been a hit in my family and my friends too. 1.Take the thick yoghurt/ the curd in a bowl. Beat the yogurt till smooth. 2.Take Cumin and black pepper and roast it on a low flame on a griddle, and whisk well till smooth powder. 3.Take fresh pineapple and chop them into small pieces. 4.Heat 1/2 cup of water in a saucepan on medium high flame and Add pineapple and sugar cook it on medium flame for 10 minutes or till it gets slightly soft not too much. 5.Strain it through a strainer. Let it be cool completely. 6.Add smooth Curd / yogurt in a glass bowl then pineapple ,syrup, add ground cumin powder, red chilli powder, pepper and salt and stir well till it mix properly. 7.Keep it in the refrigerator for an hour before you serve it. 8.Garnish it with fresh coriander leaves and temper with the roasted spices. Notes: Please make sure that the yoghurt is not sour, else it will spoil the taste of the whole thing. Don't add fresh pineapple straightway without boiling in syrup, otherwise it will turns bitter in taste.